With the aim of building a category-defining repertoire in India, Triumph Motorcycles India has launched its new 2018 Bonneville Speedmaster in Chennai. The fun and accessible contemporary of Bonneville gets a significant retrofit in capability and style to create this iconic classic cruiser. The style, performance, features, the safety combined with the trademark Triumph experience will not just catapult the brand to dominate the Indian market, but also the hearts of all motorcycle enthusiasts in the country. 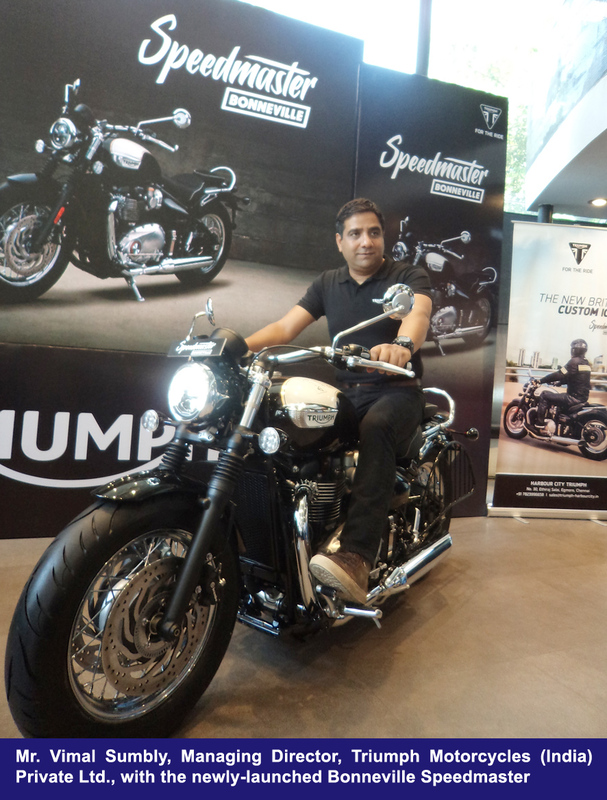 Mr. Vimal Sumbly, Managing Director, and Mr. Shoeb Farooq, National Head – Sales and Dealer Development, Triumph Motorcycles (India) Private Ltd., were among those who attended the Bonneville Speedmaster launch function in Chennai. Since 2013, in just over four years, Triumph Motorcycles has built something truly great, with a dealership network that reaches 15 cities across the country, and an unmatched portfolio of several different motorcycle models across five premium categories. Triumph Motorcycles India is a subsidiary of the iconic British motorcycle manufacturer Triumph Motorcycles, one of the oldest British motorcycle brands established in 1902 with the fastest growing luxury & lifestyle brand, with 5000 plus bike owners, got 51 major Auto Awards, crossing over 16 state-of-the-art dealerships at strategic locations in India and an upcoming Dealership shortly in Mangalore. 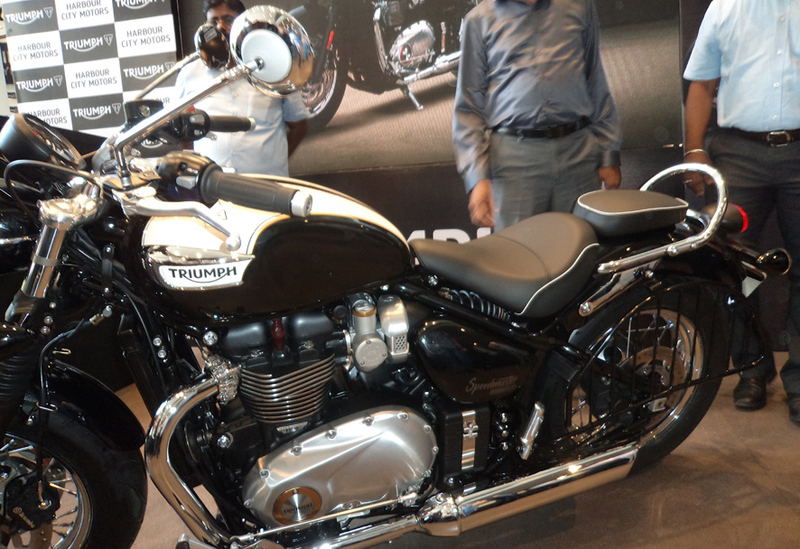 Having CKD Assembly Facility at Manesar, Haryana, Rider groups started in all dealer cities (Riders Association of Triumph) in line with Triumph Motorcycles’ brand ethos for the Ride. The salient features are it fits into Superbike, Classic, Cruiser, Adventure category and its reflects the attitude of individuals. It is 36% more comfortable than any other brand with single and twin seater and the starting price is Rs. 7.5 lakhs to Rs. 11.5 lakhs. It has 2 years unlimited warranty with 30,000 km comes with Highway kit, Hoodi, Clothing, Jacket, Brand Experience, comes in 3 colours like Black, Red and White Twin & Grey. The 115-year-old British motorcycle company is pegged at value driven population of India and it has 19% market share in India and focusing on 75% sales from metros urban high-end population and 30% comes from South Indian market and the plant at Manesar, Haryana is indigenous with make in India initiative assembled with care and it is targeting all the 20 Tier-II cities like Trichy, Coimbatore, Madurai, Salem, Trivandrum, Cochin, Calicut, Vizag, Vijayawada, Hyderabad, Hubli, Bangalore, Mysore, Mangalore, Goa, Pune, Ahmedabad, Haryana, Lucknow, Kanpur in India, through Franchisee network. Approximately they produce 1,200-1,300 motorcycle units a year and plans to expand the marketing dealership network in India. In Chennai they have only one showroom with sales & service network done by company professionals situated on the Central Business District of Egmore-Anna Salai. The motorbike with superior handling, comfort, style and attitude, authentic British custom, switchable traction control, torque assist clutch, ABS, ride by wire, single button cruise control with LED lamps the Bonneville collection, Speed Master a real gift to Indian corporates.